This report allows you to configure the virtual private cloud (VPC) Flow Logs Collector to retrieve historic data from your log groups for a given period and to collect and monitor data for selected log groups. When you first open this page, no log groups are listed because the VPC Flow Logs Collector is not enabled. To enable this feature, see the procedure. 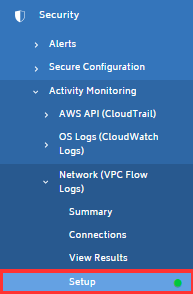 From the left navigation pane, choose Security > Activity Monitoring > Network (VPC Flow Logs) > Setup. The VPC Flow Logs – Setup page opens. No logs are displayed. Select the Enable VPC Flow Logs Collector check box. In the History section, click the 2 hours, 12 hours, 1 day, 2 days, or 1 week links to select the minutes of history for VPC flows that you want to pull. In this example, we selected 2 hours. The application automatically converts hours to minutes and auto-populates the text field with the correct value. The time it takes for the VPC Flow Logs Collector to complete this task depends on the amount of data that you requested the application to retrieve. You will not receive a notification when the task is complete, so you must check the page periodically to see if any log groups are listed. Once you have log groups, select the log groups that you want to scan. Select the Include Internal Traffic check box if applicable. A prompt indicates that your configuration is saved.